Pick it up on vinyl at Hesta Prynns Official Site! Bear Hands recently did a remix of "You Winding Me Up" by Hesta Prynn. Check out the premiere at My Old Kentucky Blog . Grab the original version of this track on Hesta Prynns EP "Can We Go Wrong" on her Official Site. The official video for Hesta Prynn's single "Can We Go Wrong" from the EP of the same name. Directed by Randy Scott Slavin (http://www.videethis.com) this stop-motion piece was made from over 13K still photographs. Check out Hesta Prynns cover of "Mind Drips" by Neon Indian below, and also get a free download! Next Drop Dead Festival will be in Beautiful Vilnius Lithuania August 18-23 2010! August 16 - August 22 - DIY arts week (we are organizing) with shows . La Roux recently performed with Heaven 17 on BBC. They collaborated on Heaven 17's track "Temptation"
Also check out La Roux, on tour now! ZAMBRI live video of "Bang for Changes"
Have you guys ever heard of this band from NYC called Zambri? They're amazing, if you like bands like The Yeah Yeah Yeah's, the cocteau twins , siouxie and the banshees, you'll love Zambri. They always put on an awesome live show.. check them out performing their song "Bang for Changes" ..let me know what you think! Bang For Changes from Zambri on Vimeo. The New Collisions are an amazing band from Boston, MA. They have done tour dates with the B-52s and Blondie, and Greg Hawkes from The Cars is joining them for their CD release show on 11/13! You can hear some of their music on their Myspace page. Make sure to check them out in NYC at The Delancey on 10/21 for CMJ fest! Alternative clubs have come and gone in Luton, but none so more memorable than 'The Switch Club' @ The Elephant & Tassel in the 80s. 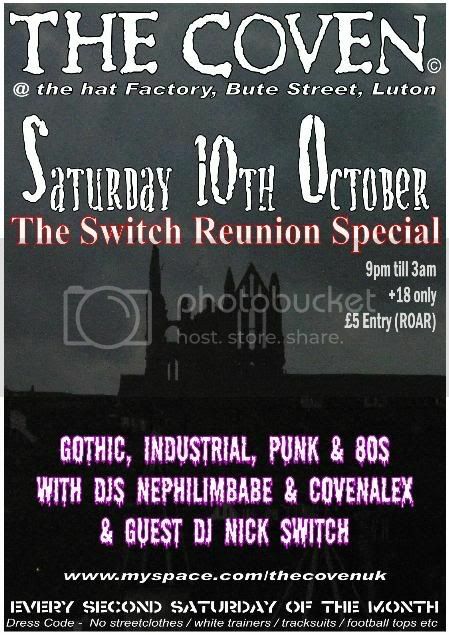 (For those that don’t have a clue what I’m on about, basically The Switch Club was Luton’s first dedicated goth/punk night back in the early 1980s. So with The Coven now being Bedfordshire’s longest running (and award winning) goth night, attracting patrons from all across the country every month, The Coven has decided to bring The Switch Club back to life for one more dark night, with special guest DJ Nick Switch performing behind the dark decks one more time. So to anybody that used to drink in such places as The Blockers, The Brickies, George IInd and even The Mad Hatters back in the 80s, then its time to relive one more night of classic goth & post punk in the darkest depths of Luton’s underground club - The Coven. Special late closing 9pm - 3am / £5 (last entry 1.00am) (R.O.A.R.) / Smoking area / Cheapest bar in town / Dress codes apply. For those coming from out of town, Easyhotel is but 20 yards from The Coven, and by pre-arrangement, host the cheapest rooms in town with specific rates just for Coven attendees. (£19.95 + £1.50 booking fee.) Please visit Official Coven Site for the official EasyHotel email link to obtain rates. Our 2nd big retro party at the Reverb. The mainroom will be the best retro tunes spun by DJ Lazarus. Holy Joe's this month will be a TRUE retro Goth room with Darkness Visible. Huge video projections of retro videos around the venue. Get out and support PANIC with your friends. $100 prize for BEST retro outfit! Jan 16 - Fetish Masquerade theme: "Nice Boots, Wanna F*ck?"